In this lesson, you will learn about Bias/Variance Trade-off in Machine Learning. This is a concept in machine learning which refers to the problem of minimizing two error sources at the same time and this prevents the supervised learning algorithms from generalizing to accommodate inputs beyond the original training set. What is Bias/Variance Tradeoff (Definition)? First, let’s take a simple definition. 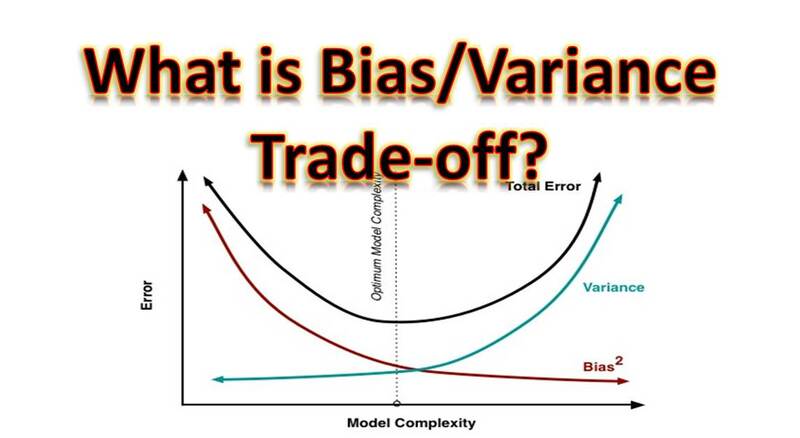 Bias-Variance Trade-off refers to the property of a machine learning model such that as the bias of the model increased, the variance reduces and as the bias reduces, the variance increases. Therefore the problem is to determine the amount of bias and variance to make the model optimal. We recall the problem of underfitting and overfitting when trying to fit a regression line through a set of data points. In case of underfitting, the bias is an error from a faulty assumption in the learning algorithm. This is such that when the bias is too large, the algorithm would be able to correctly model the relationship between the features and the target outputs. In case of overfitting, variance is an error resulting from fluctuations int he training dataset. A high value for variance would cause the algorithm may capture the most data points put would not be generalized enough to capture new data points. This is overfitting. This error is expected to be minimal. The objective is to reduce the error E to the minimum. This can be done by modifying the terms of the mean square error. From the equation, we see that we could only modify the bias and the variance terms. Bias arises when we generalize relationships using a function, while variance arises when there are multiple samples or input. One way to reduce the error is to reduce the bias and the variance terms. However, we cannot reduce both terms simultaneously, since reducing one term leads to increase in the other term. This is the idea of bias variance trade/off. The model should be complete enough to represent the data, but the more complex the model, the better it represents the training data. However, there is a limit to how complex the model can get. If the model is too complex, then it will pick up specific random features (noise or example) in the training data set. If the model is not complex enough, then it might miss out on important dynamics of the data given. 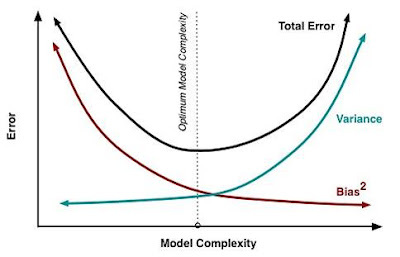 The problem where the model chosen is too complex, and becomes specific to the training data set is called overfitting. The problem where the model is not complex enough and misses out on the important features of the data is called underfitting. It is generally impossible to minimize the two errors at the same time and this trade-off is what is known as bias/variance trade-off. These three data sets are passed through the same supervised learning algorithm which produces three models. Now, let say we want to predict the output of a new input x, The three models should be able to produce the same output for the same new instance. But when you pass x into each of the models, instead of getting the same output, you get a different output(y1, y2 and y3) for the same x. This is illustrated in Figure 2. The problem here is that that the model have become too specific that it cannot capture the correct output for a new value for x. In this case, the algorithm is said to have high-variance error. Which results in a problem of overfitting. High variance means that the algorithm have become too specific. High bias means that the algorithm have failed to understand the pattern in the input data. It’s generally not possible to minimize both errors simultaneously, since high bias would always means low variance, whereas low bias would always mean high variance. Finding a trade-off between the two extremes is known as Bias/Variance Tradeoff. The graph in Figure 3 is a typical plot of the bias/variance trade-off which we would briefly examine. Relationship of variance and Error: As the variance increases, the error increases. Relationship of bias and Error: As the bias increases, the error increases. With the above assumption, we could go ahead to derive the bias-variance decomposition for squared error but that would be in a different lesson. Thank you for reading and do remember to leave a comment if you have any challenges following the explanation.